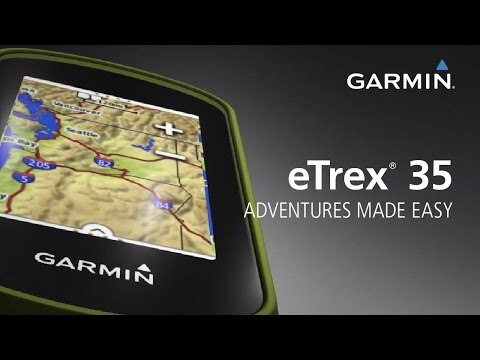 The next iteration in Garmin's tried-and-true eTrex GPS series. The Touch 35 features a colour touchscreen, a 3-axis electronic compass and a preloaded basemap, all surrounded by a rugged, water-resistant housing. High-sensitivity GPS receiver with GLONASS support gives access to a huge range of satellites, resulting in faster, more accurate performance in heavy cover areas like canyons or dense forests. Added features like a barometric altimeter, ANT+ compatibility, and Bluetooth Smart compatibility make it a simple, intuitive, and reliable device for geocaching, meeting fitness goals, or supplementing your map and compass duo. Large colour touchscreen display makes it easy to zoom in and out of maps. HotFix satellite prediction for quick acquisition and good signal lock. Activity profiles let you customize data fields for activities like climbing, biking and hiking, and make it easy to switch between them. 3-axis tilt-compensated compass shows your heading even when standing still, without holding it level. ANT+ compatibility opens up the ability to use many fitness sensors, such as heart rate straps. Bluetooth Smart compatible, so it can interact with many Garmin devices and sensors, and can receive notifications from compatible smart devices. Capable of turn-by-turn routing when paired with road maps (road map not included). MicroSD slot for even more expanded memory (card not included). Compatible with free BaseCamp software, which displays topographic maps with contour lines and elevation profiles in 2-D or 3-D on your computer screen, and lets you view and organize maps, waypoints, routes and tracks. 16 hours of battery life takes you pretty much anywhere. Works with a wide range of eTrex mounts (sold separately) for use on bikes, boats and more.